When first I looked through the pages of the book “Hacker’s Delight”, I found myself looking at the chapter about bases. There I learned a very curious fact – with the digits of 0,1 and the base of -2, you can represent any integer. Right afterwards I learned something even more interesting – with the digits of 0,1 and the base of 1-i, you can represent and number of the form a+bi where a and b are integers. Having nothing to do with this curious fact, I let the subject go. 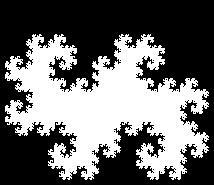 Some time later, I was reading through Knuth’s “Art of Computer Programming”, and found that with the base of (1-i)^-1, and digits of 0,1 you can generate the dragon fractal! """calculate the dragon set, according to Knuth"""
The annoying part is converting the complex numbers to drawable integer points. After doing so, I used PIL to draw the jpeg. Here’s a link to the code. This entry was posted in Fractals, Math, Programming, Python and tagged base systems, dragon fractal, fractal, Knuth, Python. Bookmark the permalink. 1. Dragon curves may be produced by lsystems (lstrings). On a side note, a version of the book ‘Jurassic Park’ had another level of the dragon curve on the openning page of each chapter. It was drawn by using lsystems. I remember that as a kid reading this book, I really liked it (and tried to write a program to draw it). 2. As you said, about folding paper – well, that really makes me very happy to know. I never made this connection between fractals and folding. Excellent! 3. It seems what I actually drew in this post is the twin-dragon, which is also named the Davis-Knuth dragon. It is constructed from two dragon curves.